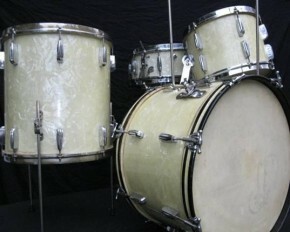 Master drummer, Roy Knapp’s Trap Set, as used on WLS Chicago’s “National Barn Dance” radio show. As the “Trap Set” began to find its way into the pop music of the early 1900’s, it took on may shapes and configurations. Some drummers approached this new instrument as though it were an entire percussion section within their arm’s reach; surrounding themselves with all manner of Tympani, Glockenspiel, Tom-toms, Chimes and other vast and varied sound effects. This was a necessity in the early days of live broadcast radio. Now DJs and “on-Air” personalities have libraries of sound samples at their fingertips, but once upon a time it was the drummer’s job to create a world of sound for the characters of live radio to live in. Radio magic aside, most working drummer’s couldn’t afford the large set-ups that radio required and that was OK because the hot sound that was working it’s way from the Bayou to the Windy City , also known as Jazz, didn’t need all the extra bells and whistles. Jazz was about improvising on simple ideas and melodies, allowing soloists to play variations on a theme. From the drummer’s perspective, it was about supporting the soloist, keeping time and adding texture to the sound; providing a solid beat you could dance to while punctuating the music with rim shots and “bombs”. The hottest band in the land at that time was that of King Oliver. Along with nurturing the career of a young trumpeter named Louis Armstrong, King also employed the skills of a young sticks-man who would, to many aspiring Jazz drummers, become the father of the drum set. Warren “Baby” Dodds never gained the fame of some of the drummers who followed him. He never became a household name or starred in Hollywood movies, but he was the first star and (as far as I can tell) the first documented soloist on this new thing called a Trap Set. Sitting on a plain wooden chair, Dodds had all that he needed to keep the joint jumpin’ all-night-long in his basic two-piece, set-up consisting of a Leedy snare and bass drum; and maybe a wood block, cowbell or Chinese-cymbal. In later years Baby Dodds added modern tunable tom-toms and Turkish-type cymbals, but I don’t think he ever stopped using that wooden chair. Warren “Baby” Dodds is the start, the beginning and the spark that ignited a fire that still burns bright among all drummers today. He played for the song and for the soloist on a kit that was deceptively simple. 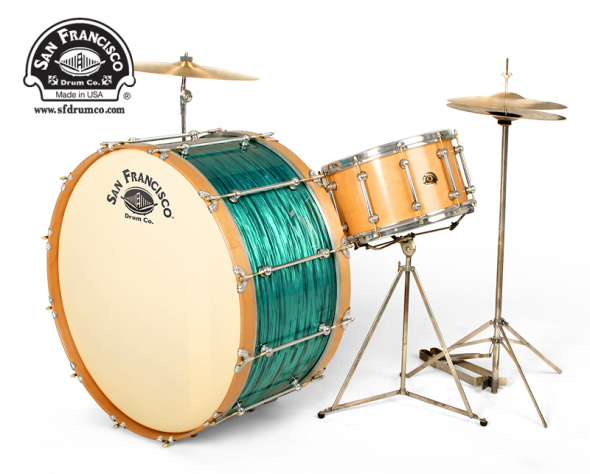 Bass drum, snare drum…what more do you need?